﻿We are suffering the loss of a special outdoorsman today. Mark Atkinson passed away today. Mark was a special friend. The kind that would do anything for you at any time. Mark was a true outdoorsman. From salmon fishing to bear hunting, Mark enjoyed it all. He was always first at throwing out one liners that always got a good laugh. He had a great sense of humor and a serious side, when required. His knowledge paralleled his keen instincts. Mark gave me something that is a big part of my life. Bear hunting. This is how I got the privilege to know Mark. He had a way of doing things that simply, worked. He was the best damn bear baiter that I have ever known. From maintaining the correct attitude to patients, Mark has taught me what I know about bears. Along with many other things. He always seemed to have a saying for every situation. One of them, I am sure to never forget. Mark helped me understand life just a little bit better. He made bad situations, not so bad. He always said that you have to have bad things in order to make good things. Bad situations are what make the good ones so special. A lesson I will hold forever. I am honored to have know an outdoorsman and to have had a friend like Mark Atkinson. Every time I sit on stand bear hunting he will be sitting right next to me. Thank you for all you have given to the world and you will forever be with us. John (Doc) Komarek was born in 1934. His father didn't hunt but his mother's, father and uncles introduced him at an early age to hunting and trapping. Doc hunted throughout his school years in the woods, fields and marshes of southern Minnesota. Doc knew in the 5th grade that he wanted to be a veterinarian. So after graduation from New Prague High School he enrolled at the University of Minnesota, earned his degree in 1958, and began a long career that lasted 46 years. While traveling around to farmers, Doc would talk to them about improving the land and making it better for ducks and wildlife. This was the beginning of his conservation efforts in southern Minnesota. He would identify landowners that wanted to create wetlands, then contact Bob Austin who did the contracting work. They would coordinate projects with John Idstrom, the local area wildlife manager. Doc found out about the newly formed Minnesota Waterfowl Association in 1969, and that is where he met Bob Austin. They began their quest to leave things better than when they found them. Doc's work led the way for many private wetland restorations, and the creation of numerous Wildlife Management Areas (WMAs). His own property was purchased to prevent wetland drainage, and the subsequent restoration of five wetlands is a showpiece that has inspired other landowners to do the same, and to sell important conservation areas to the DNR for MWAs. "We must continue to preserve wetlands," Doc says. "Wetlands improve the forests, protect native prairie and grasslands, and provide habitat for ducks and other wildlife to flourish." 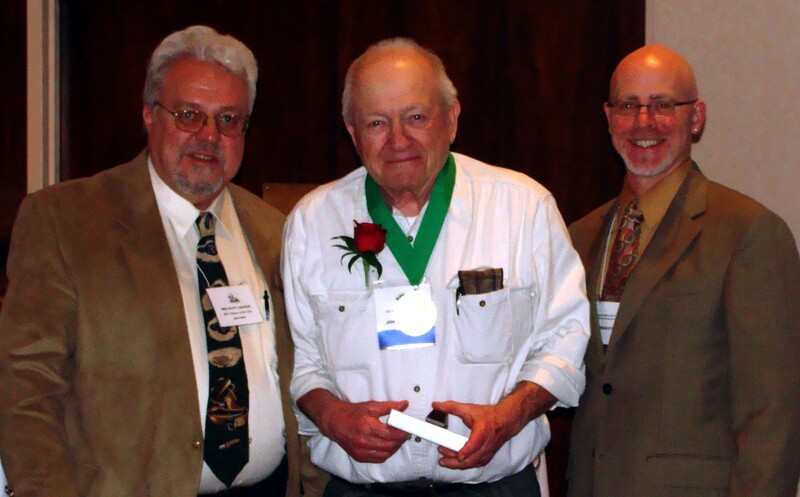 Doc was a "Golden 50" Award Winner with the Minnesota DNR in 2001, and received the Rice County Wildlife Enhancement Award in 2006. He has been married to his wife Geraldine for 56 years, and they have four children. We are proud to honor Doc Komarek this evening- for all his will and commitment to making a difference on the landscape, and for being a tireless advocate for preserving and creating wetlands for future generations to enjoy. This is what was written in the booklet the night of his induction. On Saturday, February5, 2011, my Grandfather achieved one of the highest milestones of his life long battle to improve Minnesota. He was inducted with a handful of fantastic men, such as the famous wildlife artist David Maass. Eating dinner with one of the founders of the Minnesota Waterfowl Association and being surrounded by people that have been fighting the same battle was rejuvenating. It was a small group of men, but the impact they have left is nothing short of immeasurable. I was honored to find out that they had chosen something I had written for my Grandfather to project onto the wall for everyone to see. It was titled, The Beginning of Forever. These people have all said and written some impressive things and I couldn't have been more appreciative that my work had been selected. I was also given the opportunity to give a small speech on the behalf of my Grandfather. It was one of my most precious moments to be able to speak and to thank everyone for giving people like myself a reason. The event had a great turn out with a wonderful prime rib dinner. Most of all, the comrodery was the most impressive aspect to the evening. My Grandfather, along with all the others, are proof that caring matters. I can only imagine how wonderful of a place we would live in if we had more people with such a passion for habitat awareness and conservation. I would like to thank the Minnesota Waterfowl Association for recognizing these people and their efforts. Mainly, I would like to thank my Grandfather for giving me the life I now live. I am forever grateful. My life has been rich with the outdoors and I was given the opportunity to explore my interests even further. I wouldn't be writing this article at this very moment if it had not been for him. Our eyes envision the same sight when we look upon our landscape. I will do everything within my abilities to keep his dream alive. Dr. P. John Komarek is a legend and the best man I have ever known. Special thanks to the Minnesota Waterfowl Association and Dr. P. John "Doc" Komareck.